Luke here, talking about a movie I revisited recently, after a long period of having forgotten about it entirely. Often I come across a movie that is far more than the sum of it's parts. Meaning that, while watching the movie, I have to ask myself if the things in the movie are actually happening. Who wrote this script? Who did casting? How did this get green lit? With all these things working against it, why is it that I am absolutely in love with this movie? The best example is, of course, Robocop. 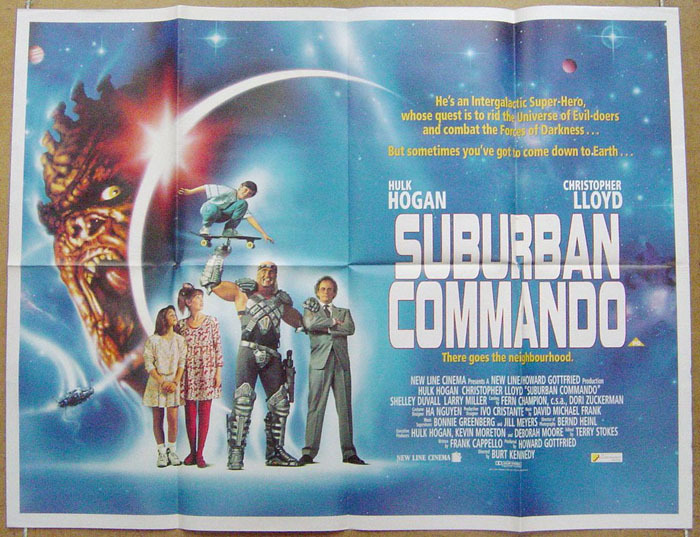 But a fair contender is the family favorite Suburban Commando. I should not, but gosh dang it I just love this movie. By '89, Not-yet-Hollywood Hulk Hogan was a household name, Hulkamania still in full swing, and the Hulk was riding high. His first movie having not quite come out yet, New Line was ready to get the Hulk Movie brand off the ground. When America's #1 galumph (Arnie of course!) opted to take his burgeoning buddy-comedy career over to Universal (1988's Twins) and New Line picked up this script, they knew exactly who should fill the role: our man Hogan. The plot is simple: Shep Ramsey (Hogan) is a cosmic bounty hunter that gets stuck in suburbia for six weeks. After answering an ad on a telephone pole, he moves in with Charlie Wilcox's (Christopher Lloyd) family. Charlie finds some crazy space equipment, which he turns on, allowing Shep's enemy's to track him down. Insanity ensues. Every moment of this movie is sickeningly ridiculous. The actors themselves seem to be fully aware that the script is terrible, but they work it SO HARD and push their emotions all over their faces and throw their arms out Kermit-style that it becomes endearing. Seriously, it's as though every part was written so that, if one of the actors couldn't make it that day, Tim Curry could just walk in an seamlessly fill the spot. The one-liners are frequently delivered as though the actors read the lines moments before standing before camera, but their out-of-context-cadence often accents the scene, if not sells it entirelys. The budget is low, but the then there are these surprising glimmers of genius. There is an alien suit that is honestly one of the most horrify images I've seen in a children's movie. The space suit and space ship are cleverly designed, though a few of the space ships (and the whole opening scene) is an almost blatant rip off of Star Wars (arguably intentional). And, frankly, some of the one-liners are hilarious. Larry Miller plays Charlie's boss, and delivers lines with such speed and wit that, if you're not really paying attention, just fly by. Come to think of it, there are visual and sub-textual jokes flying off the screen, seemingly without the movie even knowing it. Usually, in comedy movies, there's a little time for the audience to catch up when a joke is delivered. Not with Suburban Commando! And I guess that really is what makes this movie so charming: It just, serendipitously, works. It's funny, the characters are actually lovable, it doesn't take it self too seriously, there's drama that doesn't ask us to suspend our disbelief too much, and some how, despite it's flaws, it comes together to be a high-five-and-a-half. 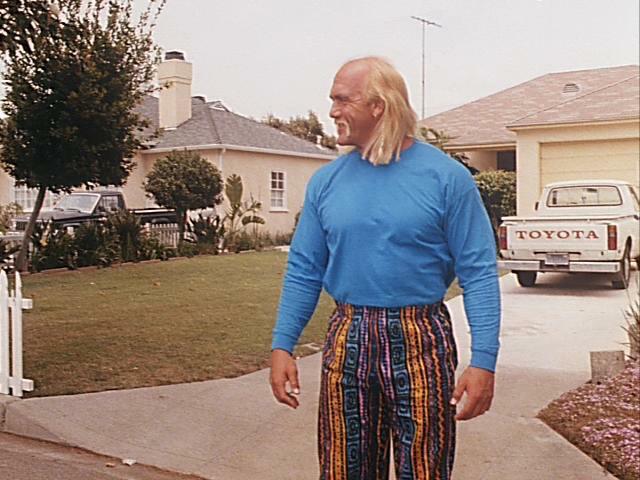 When the first New Line/Hogan movie flopped, and the second (this one) didn't really win any awards, New Line gave it one final shot with Mr. Nanny. After that, the Hogan Brand essentially dead in the water, we didn't see Hulk in a movie until 3 Ninjas: High Noon at Mega Mountain, which was only is only notable for one thing: it was shot in my home town. He may not have had a lucrative movie career, but having one gem, especially one like Suburban Commando, in your back pocket isn't too shabby. I don't condone the things Hogan does in his personal life, but that doesn't mean I can't hold this movie close to my heart. --As a side note, special effects technician Michael Colvin died on the set testing a trap door. Friends of mine who were present during the re-watching of this movie were quick to point out similarities between this occurrence and the curse of a movie that is Manos Hands of Fate. I find the similiarities chilling, myself.